Last week, we talked a little bit about the Windows Library feature. If you are interested in reading it first, please go to this Windows 10 Quick Tips – Enabling Libraries page. In that article we briefly touched upon enabling Libraries, but didn’t say much, if anything, about good uses for them. If you have not yet enabled Libraries on your Windows 10 system, you should read that article to learn how. This will help you to follow the instructions given in this article. I asked you to let me know if you would be interested in a follow-up article on the subject and the response was positive, so here we go with another post about Libraries. This week’s Quick Tips article will dive a little deeper into the Library topic and will try to give you some ideas about how they work, how to add your own, and how to use them. Libraries don’t exist. Windows is tricked into believing they do, and therefore people believe it, too. 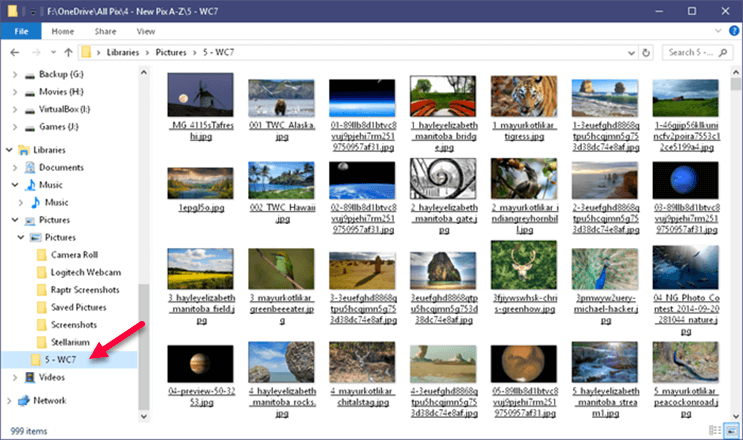 Since Windows believes it, File Explore will show them to you in the Libraries section of that program. I’ve talked before about Symbolic Links and that’s how Libraries work. 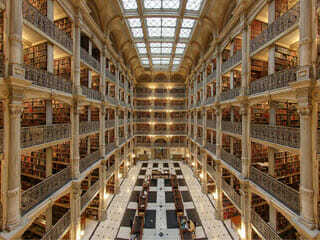 A Library is really nothing more than a “pointer” to another location. 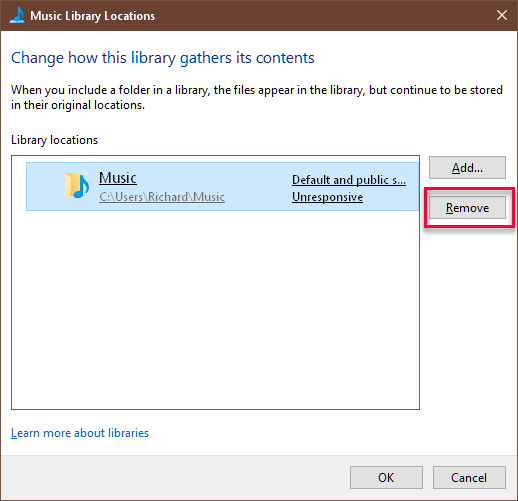 In the case of the Music Library, it points to the Music folder in your Users directory on your drive. (The Music folder actually does exist.) The other default Libraries work in exactly the same way, each pointing to their respective folders in your Users Directory. If Windows is left to its own devices, it will recognize and save different file types to the default folders. Music files to the Music folder, Videos to the Video folder, and so on. These will all be saved on your system drive in your Users Directory, or “folder” as is now the naming convention used by most. The biggest problem I have with this default behavior is that movies, for example, can take up many hundreds of gigabytes of space. I don’t want all that space used on my system drive. Consider backups, for instance… do you really want to make a backup of your system drive every day when it includes huge numbers of movies? That rarely change, anyway? I didn’t think so. That’s why I dedicate a separate partition to just movies. And another to the hundreds of thousands of pictures I have. It makes things so much easier to manage, and daily backups go much more quickly (less than 10 minutes for me). Static files like movies don’t need to be backed up every day. Once you have Libraries enabled in Windows 10, adding your own folders to a Library is a snap. Note: If you don’t have Libraries enabled on your system, this won’t work as expected. See the opening paragraphs of this post to learn how. Since this WC7 folder is now added to the Pictures Library, I no longer have to drill down a convoluted path to get to this folder. Don’t be tricked by this bit of magic like Windows is. The WC7 folder is not on the system drive. It is exactly where it has always been, but now there is a new pointer to it in the Library. In fact, if you right-click on any of those folders, there is a menu entry offering to bring you to the Folder Location– the real folder location. You can create as many of these pointers as you like by adding folders from anywhere on your computer to these Libraries. Pretty slick, don’t you think? 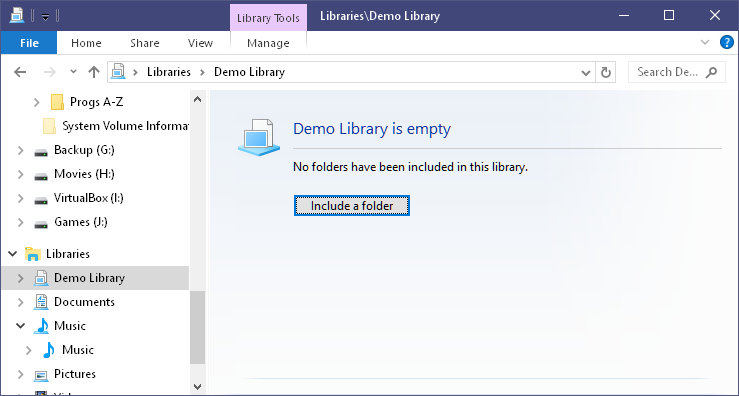 Note: See the next section for another method to add folders to your Libraries. Note: Removing Libraries and/or folders in this way does not remove the contents of the folder they are pointing to. Nevertheless, it is better to be safe than sorry, so make sure you have backups, or copies at the very least, in case something goes wrong. Note 2: You can also use the Library Manager to add folders to existing Libraries. Libraries are a very useful feature in Windows. 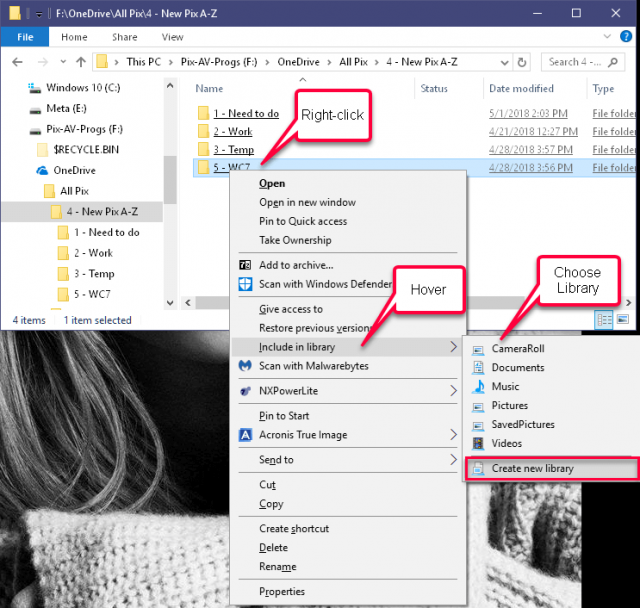 By creating your own specialized Libraries, you can include folders and types of files grouped in ways that Microsoft never thought of, and they’ll all be one click away. Sweet! One of our readers asked to have Windows 7 included in this post. As far as I know, everything we discussed in this article will work in Windows 7, too. The only differences might be slight variations in the interface which should not be a big hurdle to overcome. The same can be said for Windows 8.x, as well. Prev:How To Take Control Of Windows 10 Updates! Next:Aomei Partition Assistant Pro 7 – New Version! Wow, Richard, what an eye-opener! I’ve always ignored the Windows Library feature because it just didn’t jibe with my methodology for file organization. I’ve used the same organizational structure for nearly 30 years, and it has served me well. But after reading this article, I’m intrigued by the idea of how easy it is to tweak the Windows Library feature to my liking. I’m now inspired to take some time to play with it and see if perhaps it can replace my existing system – without having to give up anything, and perhaps even improving on it. Thank you for sharing this wonderful tip! You are welcome, KarenS. I’m glad it helped.